Since August 2014, Mississippi Power Company’s (MPC) Kemper plant has supplied about 25% more electricity at lower costs burning natural gas than could be suppled from lignite syngas. The syngas part of Kemper will not operate reliably for years, possibly never. If the gasifier ever works as planned, power costs could increase up to 65% from 2015 and even higher if the plant is unreliable. Mississippi’s Public Service Commission (PSC) can keep the increase to 11-25% if Southern Company (SO) absorbs very large costs. How much should Southern Co pay for their mistakes? The PSC will answer that question. Short of proving fraud or gross misrepresentations, it could take years to resolve. That would damage economic development in MPC’s rate area. The lignite syngas part of Kemper should be abandoned forcing Southern to write off $3.3 billion more. Management either knowingly misled the PSC or was totally incompetent. Customers would receive cheaper power paying only for the generating turbines on natural gas and not for incompetence and lies. Costs would fall to 11% in 2018 from 16% increase for 2016-2017. Pulling the plug on lignite gasification is the only way to avoid slow agony and certain financial disaster for customers, MPC or both. Roughly $2.7 billion lignite mine and syngas investments are currently “Eligible for Recovery”, excluding SMEPA’s proposed investment (Note 1). Up to $400 million/yr. could leave the state of Mississippi to compensate investors and for out-of-state skilled maintenance and operations. 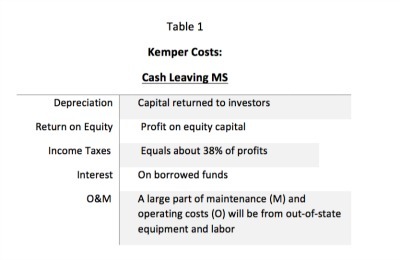 The cash drain from Mississippi if Kemper burns lignite could offset gains on the scale of the Continental Tire Plant. MPC will struggle to reliably produce power from lignite syngas. Their optimistic projections show Kemper operating mostly on natural gas seven years after commercial operations. Expect more “unexpected” and expensive problems. Kemper turbines have supplied power from natural gas since late 2014 and the PSC approved a cost increase from 2016 of $126 million/yr. or 16% over 2015. If Kemper continues to operate on natural gas with no additional assets put into rates, by 2018 rates will decline about $40-45 million/yr. to $80-85 million/yr. or net 11% vs 2015. Why not continue with low cost power paying for the turbines and transmission lines only? Because Southern does not want to pay for their mistakes and because PSC decisions in 2009-2014 create legal limits now. Were the PSC to approve full lignite system costs, minus SMEPA’s 15% and wholesale customers’ portion, retail customer costs could increase up to $450-500 million/yr. including the $85 million from 2018. Total increases would be up to 65% compared to 2015 retail customer costs. The estimates are based on MPC’s optimistic assumptions about reliability and operational performance after 2023. Actual costs could be worse. In October 2016, Southern’s CEO told financial analyst that MPC would file for COD (Commercial Operation Date) with the IRS and PSC on November 30, 2016. Less than two weeks later, Southern announced COD filings will be delayed until December 31, 2016. Unlikely. They expect to ask for a Used and Useful determination prior to June 2017 when a Kemper rate filing is mandated. PSC Determinations of COD, Used and Useful and Prudency of construction costs precede a permanent change to Base Rate. Prudently spent construction costs finalize the amount of capital used for Base Rates and will make up a major part of customer costs from Kemper. Years of rate uncertainty mean depressed economic development. The PSC is unlikely to declare the syngas facilities Used and Useful, and possibly not even operational (COD) by June 2017. MPC’s most recent operations’ plan shows Kemper will not be a Baseload plant on syngas until after 2023. Southern’s 2009-2010 commitment, repeated in 2012, was Kemper as a lignite fueled baseload plant, defined in terms of operational efficiency and reliability. They also promised lower discounted life-time customer costs than for a modern natural gas plant. Operational reliability is doubtful. Lower life-time customer costs are not achievable as will be explained in another article. To be deemed Used and Useful, the PSC can require Kemper fulfills earlier operational promises and should demand minimum economic targets. Neither operational nor economic performance will be demonstrated before 2023. Gulfport’s Future: Better or Like 1933? 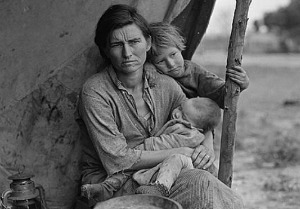 would Southern finance that $1 billion? Any equity financing would upset the current 2:1 debt equity ratio plan, driving up rate payer costs. Financing $1 billion of debt on MPC’s balance sheet would be costly and may be impossible. Lacking gasifier COD and Used and Useful by the mandatory June 2017 rate filing, MPC might file to adjust current rates for the generating turbine assets and make them permanent. The fate of the gasifier, mines and pipelines would be in limbo. Years of uncertain power costs would be terrible for business investments and family plans. Gasifier based increases between 2017 and 2023 should be minimal and subject to future review for refund to customers based on final Used and Useful and Prudency determinations. Meanwhile, billions of dollars will depart Mississippi for Atlanta and New York. Southeast Mississippi could go back to the future. The PSC and the Mississippi Public Utilities Staff (MPUS) must find options to substantially reduce costs to retail rate payers. They get it. Southern will push back hard as reductions for rate payers will be an unrecovered cost to MPC and SO. The PSC has three broad options for retail customer cost increases ranging from 11% to 65% compared to 2015. Commissioners face legal constraints making permanent lowest retail cost option, an 11% increase. They still have considerable latitude to shift costs from customers to MPC. Another article will deal with PSC options in more detail.